The BeDazzler is back again and it’s the fashion craze of the season. Even if you’ve never threaded a needle, you’ll be BeDazzling in minutes. You can bedazzler a hat, a shirt, a belt, a scarf or a sweater! It’s easy. It’s fun. It’s fabulous! You get the original BeDazzler plus all the rhinestones, studs and stars you’ll need! he Bedazzler gives you everything you need to light up your wardrobe from head to toe. It’s easy to use, fun and fabulous. Just snap, push and pop and you can save hundreds of dollars by adding your own rhinestones and studs to your wardrobe. Brighten up your wardrobe today with the fantastic Bedazzler. 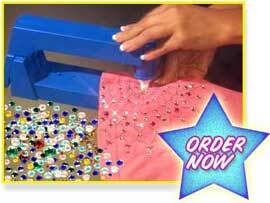 The Bedazzler machine is the hottest craft item in America today. You will get over 150 brilliant rhinestones and gleaming studs that you can easily add to virtually anything.